The Fourteenth Summer of Angus Jack - Book Trailer from Jen Storer on Vimeo. 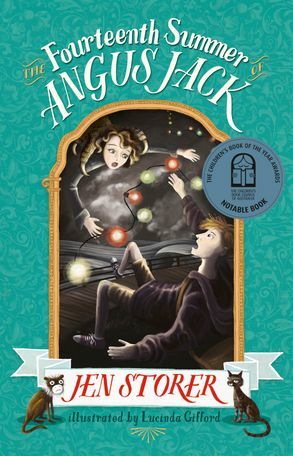 Angus Jack and his sister, Martha, have moved to Australia with their father to start a new life. They end up living in a bayside suburb, next door to a peculiar old lady called Reafen, who is a second-hand dealer. To Angus and Martha, Reafen seems harmless enough. But who is she really and where did she get all the weird and creepy stuff in her shop? Reafen kicks off a chain of events that draws Angus into her world, into ancient feuds, wild magick and bitter rivalries, into the astonishing dramas of the Old Realm.